How many of your events include a Fund-a-Need? How many events rely on physical bid cards / paddles? How many events incorporate mobile bidding into the special appeal? 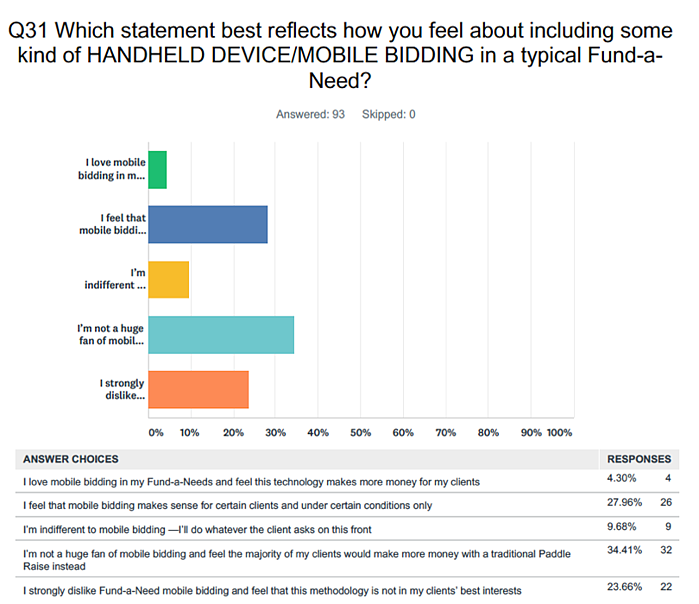 How do you feel about the use of bid cards versus mobile bidding for the Fund-a-Need? Where do you recommend placing the Fund-a-Need during a 5-package live auction? How about a 10-item auction? Whether you're considering including a direct ask for the first time at your fall fundraiser or looking for best practices, we hope the data will be helpful for you. Nearly 100 auctioneers were surveyed at last month's 2018 Benefit Auction Summit hosted by the National Auctioneers Association. 74 percent of those polled have worked in the auction industry for 6 or more years. 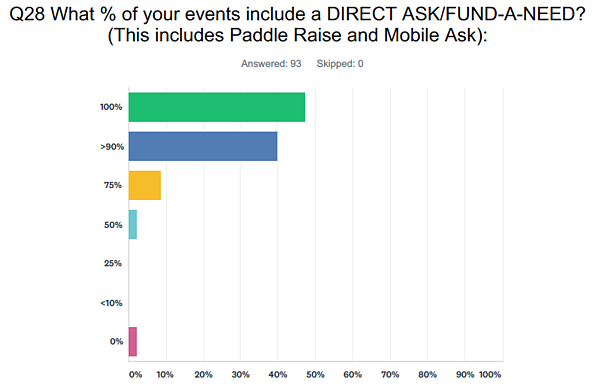 Below are some of their impressions of Fund-a-Needs and Direct Asks in fundraising events today. 1. How many events include a direct ask or Fund-a-Need? "The Fund-a-Need, special appeal, the paddle raise: Whatever you call it, a direct fundraising ask is incredibly important to me and my clients," shared benefit auctioneer Dean Crownover in a recent recording of our podcast, Events with Benefits. 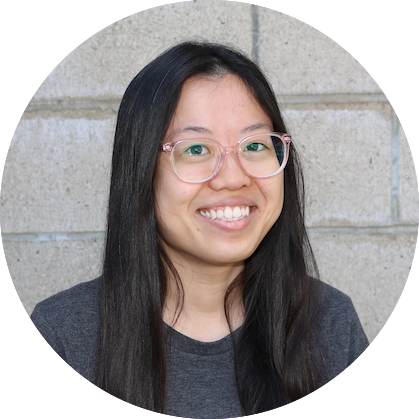 "In essence, it's free money raised out of thin air, and often the night's biggest revenue stream." The easiest way to ruin a fund-a-need? Not having one altogether! Indeed, a whopping 96% of auctioneers say the great majority (over 75%) of their events include a direct ask or fund-a-need; most (88%) report over 90 percent of their events include the ask. When your most engaged supporters are all together, in the same room, celebrating your impact - take advantage of the opportunity with a direct appeal. 2. How many events rely on physical bid cards or paddles? An overwhelming 95% of auctioneers say at least 75% of their events use paddles/bid cards - no mobile bidding - for the direct ask. Bid cards or paddles are imperative to a successful fund-a-need for two reasons: First, bid cards amp up the emotion. Seeing cards being lifted high in the air all across the room will be much more impactful for a donor than people trying to participate on phones. The use of bid cards or paddles also expedites the process. Raising cards allows the auctioneer to quickly identify the bidder and move along at a steady cadence. For more, check out this video in which benefit auctioneer Danny Hooper explains the importance of bid cards. 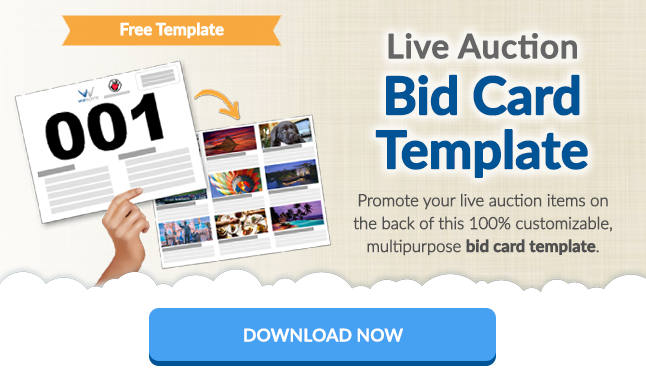 To make the most of limited real estate, get your free live auction bid card templates below. 3. 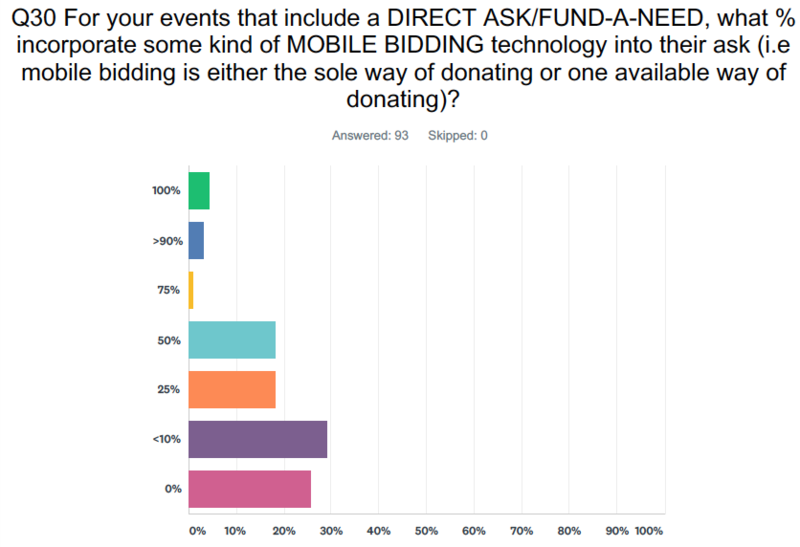 How many events incorporate mobile bidding into the special appeal? On the flip side, just 18% of auctioneers say at least half of their events totally or partially incorporate mobile bidding into the ask. 63% say less than a quarter of their events use mobile bidding, and 26% never see it. 4. How do auctioneers feel about bid cards versus mobile bidding? 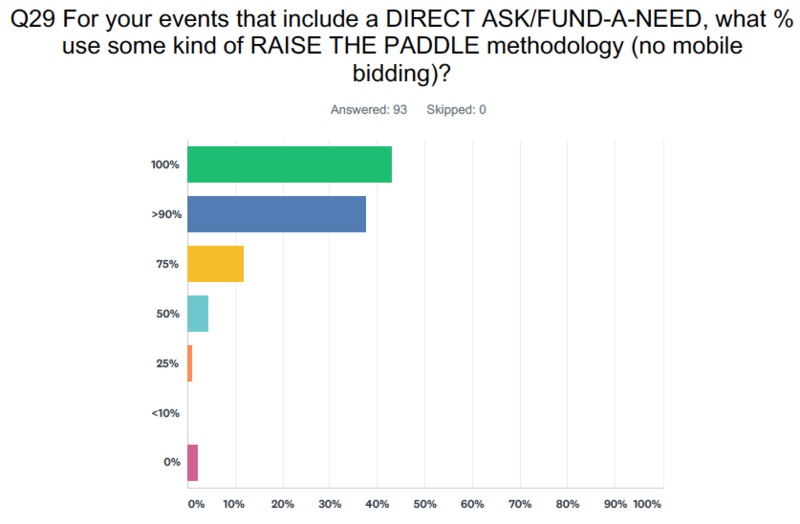 57% of auctioneers said clients typically make more money sticking to a traditional paddle raise in the appeal, while 28% said mobile bidding in Fund-a-Needs may make sense under certain conditions. 5. Where do auctioneers recommend placing the Fund-a-Need during a 5-package live auction? 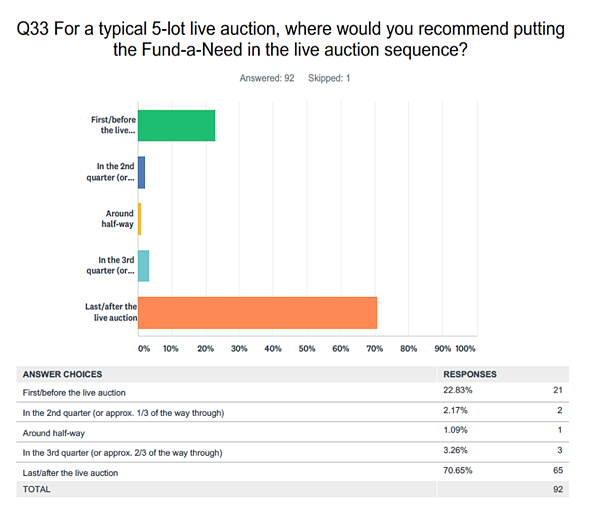 In an auction with 5 packages or items, most auctioneers (65%) recommend putting the fund-a-need last or after the live auction. Only 23% suggest doing so first, or before the live auction. Just 6% include the special appeal in the middle. Crownover is in the minority that places the Fund-a-Need up front. "It used to be standard that auctioneers would put the fund-a-need at the end or middle of the live auction. I have now moved most of my clients' Fund-a-Needs to the very front, toward the welcome, shortly after people have gotten dinner. It has had tremendous success." Benefit auctioneer Scott Robertson has also increasingly used this technique, thanks to improved energy levels. "People with more energy are more awake and receptive to the message, so they give more," Robertson says, and an energetic fund-a-need helps set the tone for rest of event. Another bonus: With everyone's full attention on the direct appeal, you've clearly established this fundraising portion as the centerpiece of the night, not a tactic to get "leftover" funds from people's predetermined budgets. 6. How about a 10-item auction? When it comes to live auctions with 10 or so items to sell, the numbers round out a bit more. 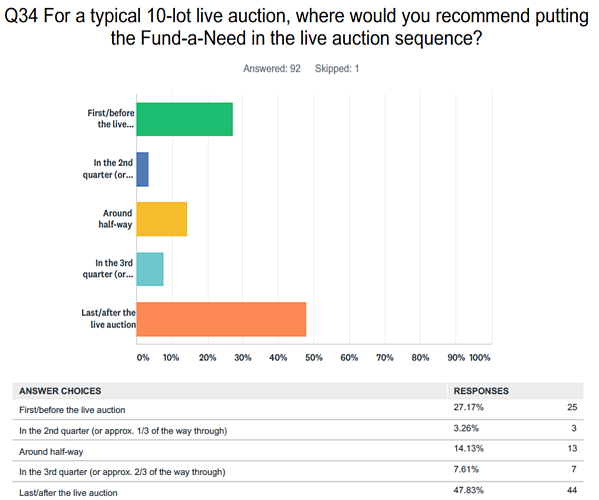 48% of auctioneers still choose to do the fund-a-need last, but 27% would move it first. Another 24% would conduct the appeal sometime during the auction (most halfway). So there you have it: the professional opinions of benefit auctioneers shaped by conducting hundreds of events per year. We hope the data shapes your decisions and encourages you to try a direct appeal in the upcoming fundraiser.